You can download for free the version for Hauptwerk 2/3 of this sampleset on the Hauptwerk.com website. If the sampleset is what you expected you can make a voluntary donation. 50 % of this donation goes to the "Stichting Oude Groninger Kerken" for maintenance of the church and her organ. If you prefer the version for Hauptwerk 1 or you have problems with downloading large files then you can order a DVD with both versions as usual. For more information see our payment-page. The organ was built in 1741 as a cabinet organ by Chr. Müller. In 1845, H.E. Freytag installed it in the church of Oosterwijtwerd. 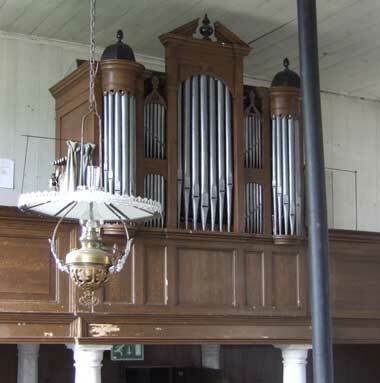 In 1895, J. Doornbos converted it into a church organ. Due to water damage, the organ was repaired in 1950 by M. Ruiter. Finally, from 1995 to 1996 the organ was restored by A.H. de Graaf. Windpressure: 72 mm (2.83 inch) Windsupply: Doornbos. Tuning: a' = 435 Hz. Manual built by Müller, covering not original. Pedals: Pull-down pedal of 13 keys. Possibly made by H.E. Freytag. A few stops are still original.